'Tis the season for biographies (at least in my library) and here's a great one on a subject that I'm betting most kids wouldn't know about. I first heard of Dian Fossey in the book Gorilla Doctors. The book gave a brief history of the study of mountain gorillas and when I read that Fossey was murdered, possibly because of her anti-poaching activities, I was intrigued. I wanted to know more. Ever since Fossey was a little girl, she always loved animals. In college she tried business but hated it. She tried veterinary medicine but couldn't pass the science classes she would need. Eventually she studied occupational therapy and got a job at a hospital (in Louisville, KY, which, incidentally, is where I grew up). She worked at her job, but she dreamed of going to Africa and studying animals. Fossey saved and finally took out a loan to go to Africa where she happened to meet the anthropologist Louis Leakey. Eventually that connection led him to offer her a job studying mountain gorillas in Uganda and Rwanda. It wasn't an easy job. She was alone most of the time on a cold mountain, surrounded by mist. She didn't have the modern conveniences she was used to and the countries she worked it were constantly engaged in civil wars. But Fossey loved her job. She learned tons about gorilla behavior and got close to the gorillas themselves. In fact, she was the first person to get really close to mountain gorillas. And she hated the poachers. Humans were encroaching on the gorillas' territory with farming and trapping. Poachers would sell the heads and hands of gorillas and people capturing infant gorillas for zoos often had to kill the entire gorilla family in order to take the infant. Fossey loved the gorillas and she was determined to fight back. She destroyed poachers' traps, shot at trespassing cattle, and spoke openly about the need to limit tourism. No one knows who murdered Dian Fossey or why. She was a passionate woman who cared deeply about what she did. She was a great teacher and speaker. She might still be alive today if someone hadn't cut her life short. The story of Fossey's life is an interesting and inspiring one. Here's another strong woman to add to your women's history booklists. I've found National Geographic's Photobiographies series to be a great series of biographies with pictures that really make the subject matter pop. An afterward includes information about the state of the mountain gorilla today. The book also includes a time line, index, and extensive bibliography. The next addition to my to-read list is the book that Fossey wrote (which was turned into a movie), Gorillas in the Mist. 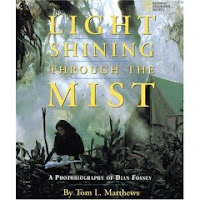 I really enjoyed Light Shining Through the Mist and I might never have picked it up if it hadn't been for Gorilla Doctors. Amazing the connections you can make through literature. Happy Nonfiction Monday! Go check out the roundup at Picture Book of the Day. Hi--I am the author of "Gorilla Doctors," and found your blog through a Google Alert for my book's title. I'm very glad you came to know about Dian Fossey's work through "Gorilla Doctors." Fossey's work was widely publicized by National Geographic during the 70's and 80's, and of course the movie "Gorillas in the Mist" introduced her to many more people. But I've noticed that children and younger adults haven't heard much about Fossey, which is a shame. She was a very complex, committed, and interesting woman. If you enjoy Fossey's "Gorillas in the Mist", you may also enjoy George Schaller's "The Year of the Gorilla." George studied mountain gorillas before Fossey and he was an inspiration to her.